In the museum, you will learn about the rich history of Jáchymov from the times of the heyday of silver mining, over the beginnings of radon baths and communist oppression of political prisoners forced to work in local mines up to the modern history of the city. Exhibits are labelled with Czech and German signs. The tour of the museum includes a tour of the extensive underground complex under the mint facility. Part of the cellar is arranged as a lapidarium. 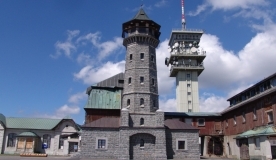 The tour in Museum Jáchymov lasts about 90 minutes. The guided tours in German are provided to groups of minimum 10 members. There is also a short guidebook in English and Russian available.